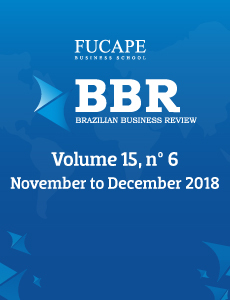 Since our last editorial I represented Brazilian Business Review in two important events. The first event, SciELO 20 Years, took place in São Paulo from Sep 26th to 28th with a focus on open science. BBR sponsored the event as a “Friend of SciELO”, being a proud member of the SciELO Network and supporter of open science initiatives. The second event, EnANPAD 2018, took place in Curitiba from Oct 3rd to 6th. For the first time in history, a “Meeting the International Editors” took place at EnANPAD, with invited editors from BBR (Brazilian Business Review), BAR (Brazilian Administration Review), Latin American Business Review, IT&P (Information Technology and People), and IJEM (International Journal of Emerging Markets). We briefly presented BBR’s vision and editorial policies and then participated of a Q&A between members of the academia and the editors. Figshare also began distributing BBR’s contents, a feature we announced in May this year. Figshare is a repository meant to extend how research is disclosed, allowing authors to share other materials besides the article itself, such as presentations, datasets and code. It is one more channel to improve discoverability of BBR’s articles, aligned with the journal’s strategy of internationalization. You may take a look at the platform here https://scielo.figshare.com/bra-bbr.